Some times in Youtube video size is not convenient to your computer screen. In YouTube you can only shift between three sizes that is normal, extended and full-screen. Video Resizer for YT is an chrome extension that allows users to resize their video player dimensions freely. Vedio Resizer for YT Allows you to freely resize the video player on youtube. After you installed extension then go to Youtube and play any video as you want. 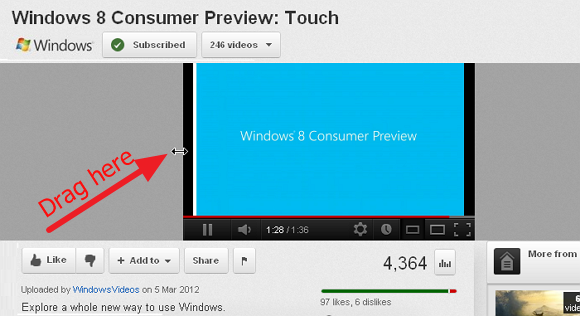 Move the mouse cursor over they grey background of youtube video player. Now you can drag and resize the video player easily. youtube video player automatically changed it's video quality according the video size you selected.